The Christie Antique show is coming up on Saturday, September 10th at the Christie conservation area near Hamilton, Ontario. It is Canada’s largest outdoor antique show and draws thousands of people to both the spring and fall shows. It was started in 1988 by Jeff and Wendy Gadsden in partnership with John Forbes, and a few others investing. I remember everyone getting excited about the prospect of a new outdoor show in the Golden Triangle area. 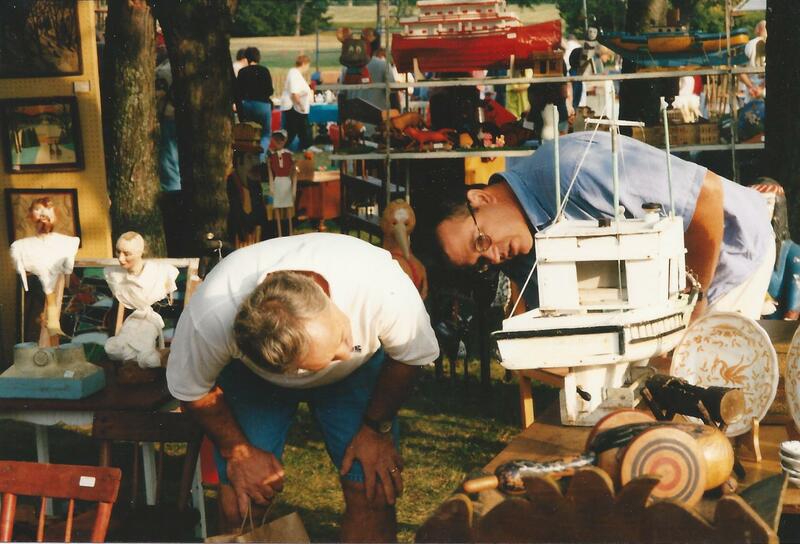 At the time the Flamborough Antique show held nearby, also in the spring and fall by promoter Bill Hogan was the only large outdoor show, and it was uncertain how this new show would stack up. We liked the fact that it was a one-day show held on Saturday so we didn’t need to miss the Harbourfront market in Toronto on Sunday which was still going strong. Also, Christie is an hour away from our home so we didn’t have to factor in staying overnight at a motel. From the beginning the Gadsden’s and Hogan ran a tight ship. There was active vetting and anyone foolish enough to try to pass off a reproduction or junky piece would be certain to be brought to task and made to remove the offending item, or in some extreme cases be thrown out altogether from future shows. Older folk art was o.k., but mass produced, contemporary folk art was not; especially if misrepresented. I remember one spring show when Jeff made the dealer next to me return the money to a customer, and accept back an Aime Desmeulles horse that the gentleman had bought for a large sum because he was told it was old and rare. He was not happy when someone had told him the truth, and so he went to the promoter’s office to complain. There was no tolerance for early packing, no matter what the weather conditions. You could be sure that everything would be on display right up until closing time at five. Load in and load out was carefully supervised. It was in every sense a well-run show and collectors and dealers alike loved it. Many dealers would come the night before to set up their tents, and then settle in for the night so they would be ready for the morning rush. This continues to be the case. You could not unpack your stock, so in the evening there was a fair amount of partying and card playing going on. Not to mention a fair amount of subtle trading and purchasing; everyone being very careful not to be caught as this was forbidden. You were allowed to unpack starting at 6 a.m. and so those two hours before the field was open to the public at 8 was crucial. Typically, you would do a lot of dealer business during this period quite often selling many of your nicer pieces as they came off the truck. Clay Benson and others would race around buying, following up leads given to them on their walky-talkies by scouts also combing the fields. The negotiation was accomplished quickly and when a deal was reached it would be completed later in the day when things had calmed down. I loved to buy at the show but I would always stay in the booth during this critical period because I was most interested in selling, and the type of thing I buy was esoteric enough that it would still be there later on. It felt great when on occasion you had sold enough to consider it a successful show before the public had even entered the field. This was the hay day, and everyone was tuned up for it. Like everyone else, we had our fans. 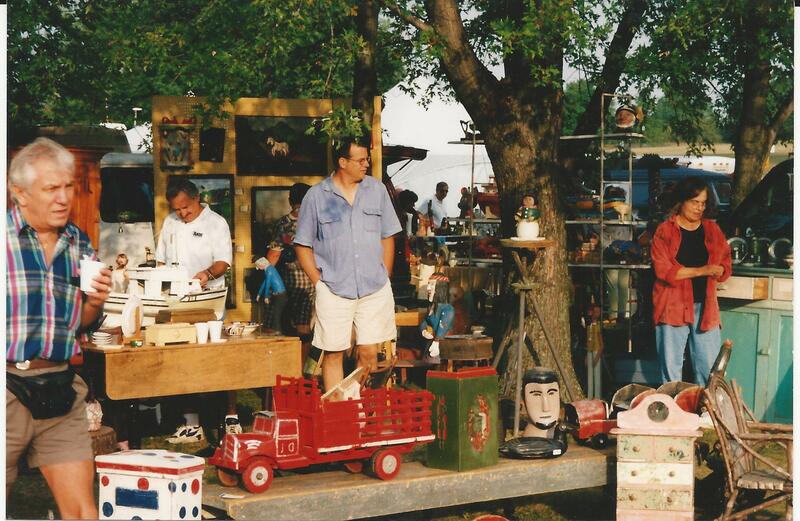 Early on, there was not a lot of folk art on the field so folk art collectors made our booth one of their first stops. These “keeners” were also in a hurry to buy and move on, but many of them would circle back later for a visit. Things were typically busy until about ten, when it would slow down enough that Jeanine could handle the flow, and I would take off for a couple of hours to comb the field, coming back about every twenty minutes to unload purchases, and check how things were going. I could tell by the expression on Jeanine’s face as she saw me approached with my treasures if I had some “splaning” to do, as Ricky Ricardo used to say. 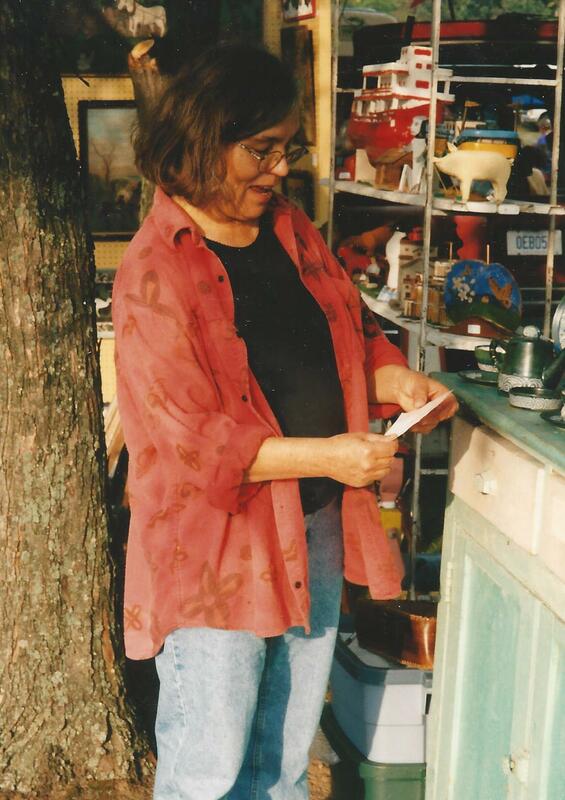 I loved it on the occasions when I would quickly sell again something she would flatly tell me that “you’ll be taking that piece to your grave with you”. But then again she was often right, and we mostly agreed. She would take her turn after lunch, and it was my turn to hold down the fort, and offer comments on her purchases. We didn’t have any cell phones or walky-talkies at this point which was just as well. There’s nothing worse in my opinion than trying to explain and convince another of the relative merits of a piece, talking on your phone in someone’s booth while they look expectantly on. It takes the fun out of it. For the first several years we had a spot right in the middle of a row in broad sunlight. It was awfully hot until we purchased a tent to provide shade and shelter. As helpful and necessary as it was, the first twenty minutes in the morning setting up the wretched thing, and the last twenty minutes at the end of the day packing it, where my least favourite parts of the day. Some swearing was involved as you would inevitably at some point pinch your skin putting the stupid thing together. 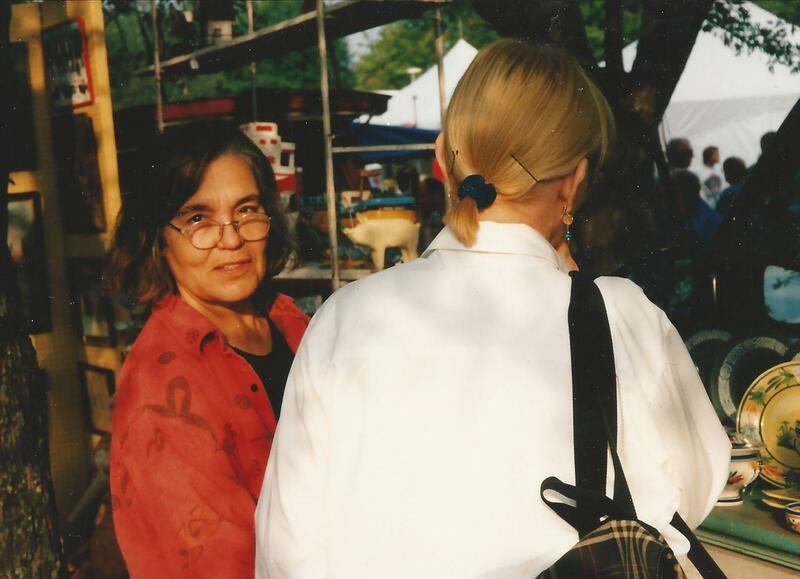 When Marjorie Larmond quit doing the show in the late nineties she was nice enough to bequeath her spot under a big shade tree to us. Jeff went along with her wishes, and so after that we had a lovely spot at the back of the booth, in the shade to set up our picnic lunch. These lunches started out innocently enough, but being French Jeanine kept upping the ante until it became quite a production with tablecloths, a range of excellent cheeses, beverages, etc. Many friends got in on this, and it became a very pleasant way to spend the slow time after two, until it was time to start wrapping up the business and beginning to pack at five. We tried to keep it subtle and behind the truck and we made sure that someone was always on duty up front should someone wish assistance. Still some people would give us some very odd looks. This reminded me a bit of the shows in France where at mid-day, everyone sets the table, and puts out their lunches and bottles of wine and you carry on regardless. The French have their priorities straight. We happen to agree with a no packing before show end policy so although we would have our boxes and packaging ready we would wait for the announcement that it was over and it was o.k. to start. It usually would take a couple of hours at a leisurely pace to pack up and leave. We were always exhausted, but most often happy and satisfied with our day. There is a Chinese place we like called “the China King” going into Brantford where we would stop and eat before heading home. I don’t think Chinese food ever tastes better than at the end of a long, arduous day which also provides the satisfaction of good visits, exciting purchases, and if lucky, lots of sales and a full wallet. We did our last Christie in 2010 which as it happens is also the last year the Gadsden’s ran it. Anyone who has attended regularly over the years will tell you Christie has changed dramatically, especially in these last few years. To everything, turn, turn, turn; so let’s not get maudlin about it. There’s still plenty of wonderful stuff turning up on the field, and many good dealers. Look harder and filter out the stuff that grinds on your collector sensibilities. You just might find something to cherish, and you’re likely to enjoy yourself. Quite possibly snag a nice lunch. We’ll see you there.